Apart from being known for its quite severe history of liberation and revolutions, Paris is an everlasting inspiration for wanderers. No mater how trivial it is, but the City of Love has always been and will always be a place of romanticism drawing sweethearts from all over the world to taste the cheeses, hear an accordion playing some ballads and, of course, see the Eiffel Tower. Even though it’s a heck of difficult to get to the top because of the myriads of tourists dashing from all over the globe, paying a visit to the famous Eiffel Tower is a must. The 324-meter beauty gazing upon the ville will give you the most memorable views of the whole trip. It’s also nice to have a glass of cold sparkling wine in one of the floors’ bars. Furthermore, the peak of the tower is surely the most romantic place to propose or, simply, to take a selfie with almost 20 thousand lights in the background. The Basilica of the Sacred Heart of Paris, located in the district of Montmartre, is not only a church that welcomes thousands of worshipers annually but also a place of fable romantics and outstanding beauty. The temple is situated on a hilltop unfolding its staircase alongside a funicular downwards to the city. White domes with their gracious ornaments and chapels outside and 18th-century frescos inside are a sightseeing of wonders. The district of Montmartre is known to have been a home to many artists and painters starting with the end of the 1700s. Here, one can find a museum established in a mention that centuries ago belonged to an impressionist Renoir and realist Valadon. In the backyard of the museum, there are installations of famous artists’. Follow a path of tourists a bit to the South, you’ll find another museum, Museum of the Romantics. This ordinary house with green window shades and a spiral staircase exhibits works of G. Sand, A. Scheffer, L. Hersent, A. Clesinger and many others romanticists. Delacroix’s works can be found in his former studio and now an exhibition place The National Museum of Eugene Delacroix such as ‘Chios and Missolonghi’ or the ‘Death of Sardanapalus’. If you’re a fan of Notre Dame then the mansion of Victor Hugo is definitely a place to visit for you as well. The place is easily reachable through Parisian narrow alleys and marketplaces where they sell antiques and curiosities. There are shops and curiosity stores on the right side of the Seine that will absorb you with the 1800s nostalgia. In Passage Verdeau one can find worn out by time books and manuscripts, whereas in Passage Jouffroy there are miniatures and toys. Also, if you are to try a typical cuisine of the 19th century, then head to Le Grand Vefour, where such foods can be discovered. Canal St-Martin is for sure one of the most impressive places in Paris. It penetrates the city’s main streets and is embroidered with dozens of metal and stone bridges built in the 19th century. You may enjoy the view of one of the bridges open upwards in order to let a ferryboat through, or you can take one of the boats and have a ride in the canal. 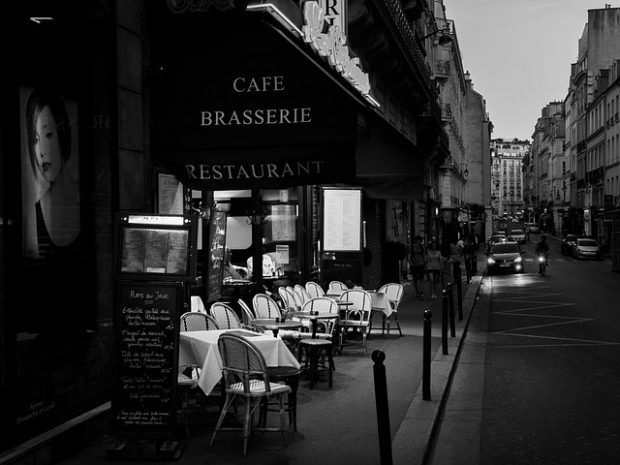 There, you can either enjoy a traditional French meal or open up a bottle of Champagne as you pass by crowded by tourists streets. Or, if waterboarding is not an option, it’s always possible to get a few things to go in Pink Flamingo and gaze upon the ville on a bridge. In case, if a ferryboat is too crowded and you’re looking for some time to be alone, then it’s always possible to rent a two-person boat at Bateaux Parisiens. Moreover, it’s a fascinating experience to come by to the famous garden of Jardin Shakespeare, which accommodates most of the greenery (trees and flowers) from the Bard’s works. It’s unexplainably difficult to find a decent food court in Paris since the majority of places are either fast-food or too fancy for just two tourists. Nonetheless, Les Ombres has an amazing view on the Tower and a beautiful angle for pictures; whereas La Tour d’Argent offers a spacious rooftop for hot nights out, where you can contemplate about your future plans. More romantic than a restaurant with a view on the Eiffel Tower or a rooftop with an open bar can be only a restaurant refurnished in the best fashion of the 17th century with a labyrinth of candles, Le Coupe-Chou. Also, it’s a must to visit Bouillon Racine as a destination of a lovely night out. Or, Le Frank that is located next to the famous Art Centre set up by Louis Vuitton Foundation. All in all, Paris is not a one-sightseeing city, Eiffel Tower, but of thousands of places that fable one’s heart, making them wonder if this day can last for good. So pack the bags and prepare for the most explicit journey of your entire life!